Note the interaction between the monthly benefit paid and the unemployment rate for the state versus the account balance of each state. For example, Mississippi has 9% unemployment but they pay the least per month and they have over a half billion net in the fund. California and Michigan are by far the largest fund debtors. Note that Washington D.C. has 10.9% unemployment, but only 22% of their unemployed are actually receiving benefits, the lowest in the nation! So, this table provided a state by state total in the trust fund for August and I simply hit the sum key and it all added up to a total of $16.96 Billion. That’s nice, but now I need to know how much it was in the past so that I can calculate a burn rate to determine how fast this fund is falling. 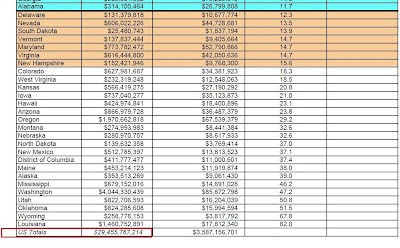 Compare the states in the table from February (page 4 above) who had borrowed funds with the August table above! WOW. 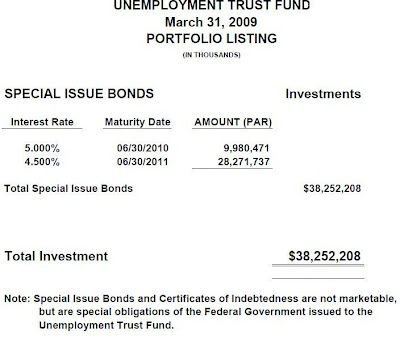 Note that in February, the total trust fund balance was roughly $29.5 billion. 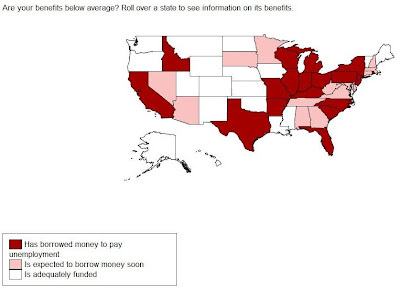 At that time, there was only $3.5 billion in loans to the states (August = $13.6 billion). In the six months from February to August, that fund’s balance has dropped by $12.5 billion, a burn rate of approximately $2.1 billion per month ($12.5B/6 months). 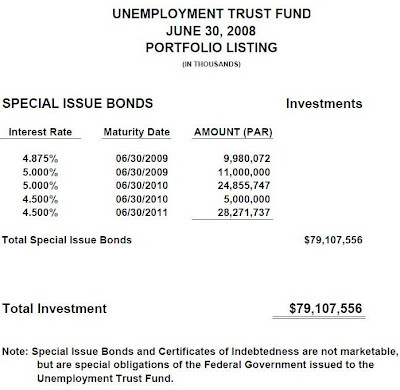 With a net balance of only $16.9 billion, the math of this calculation says that the unemployment trust fund held by the U.S. Treasury would hit ZERO by the end of April, next year at the current burn rate and WITHOUT any further increase in the rate of borrowing by the states. So, from June of 2008 to June of 2009 the trust fund’s portfolio listing fell by $49 Billion. Over a 12 month period that’s a burn rate of $4.08 Billion per month over the entire year! Note that these instruments are NOT marketable securities, they are “special obligations” of the Federal Government to the Trust Fund. 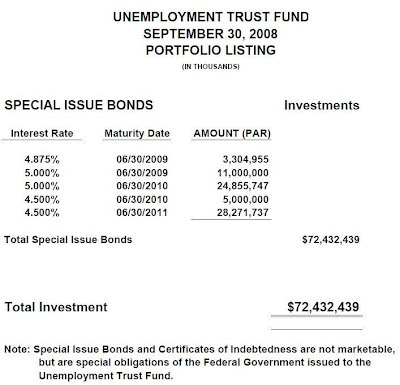 In other words, the government “owes” money to the trust fund, but the trust fund has been drawing it down. 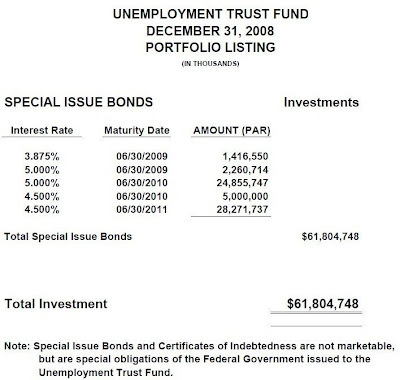 The difference in what the Treasury owes the fund and what the states have borrowed from the fund is roughly $16.5 billion, or approximately the same amount as the trust fund is currently worth. $16.9 Billion divided by a burn rate of $4.08 billion per month means that the fund has only 4.14 months to live at the current rate, or it will dry approximately the first week of January of next year. That puts the go broke range between January and April of next year, IF the rate does not accelerate. We’re now hearing talk from the economic geniuses at the White House, and elsewhere, that they are considering an emergency extension of benefits. Of course that would have to include money that must come from somewhere, any bets on where? Excuse me, I have to wipe up my shoes. Of course they’ll find the money, all they have to do is lock the politicians behind closed doors and threaten them with an insolvent fund if they don’t cough up more fiat. They will. It’s all a Ponzi finance scheme that has reached the end of the line so they must pretend as long as they can. The most they can do is stall the inevitable, it’s too late, the damage is done.